Starting from pole position, the 16-year-old from Perth made a break after setting a new lap record on lap four, only for a missed gear on lap eight to see his lead diminished. The slipstream effect to allowed Rory’s rivals to pull back to him down the long Silverstone straights but despite passing and repassing numerous times, Rory led across the line for all but two of the 11 laps. Strudwick remained glued to Rory’s back wheel until a storming last lap saw Skinner pull out a vital half second lead by the time the chequered flag came out, with Cook relegating Strudwick to third. “This is a special victory for me,” said Rory. “It’s a brilliant win and even better to win it in front of this crowd at the British Grand Prix. The weather looks like it’s going to be a bit different tomorrow but we’ll just see what happens. With 25 points for the race win, Rory moves to within four points of Strudwick at the head of the British Talent Cup championship, with a second Silverstone race scheduled to close tomorrow’s British MotoGP event at 16:00. Today’s race can be seen as live on the British Talent Cup Facebook page and YouTube channel, while BT Sport subscribers can see the race on the broadcaster’s app. UPDATE: Sunday’s race was cancelled, along with all of the other MotoGP action, due to inclement weather. 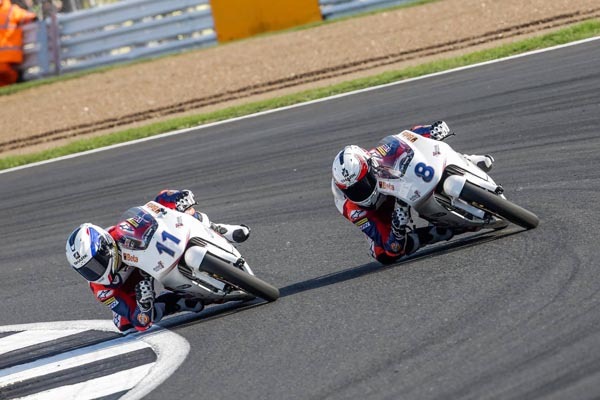 The next British Talent Cup races take place alongside the Bennetts British Superbike Championship, at the TT Circuit Assen in the Netherlands, on the weekend of 29-30 September.